Yesterday we helped Josie cross the Rainbow Bridge. We only had her for a very short ten months, she was an unexpected return after being in a home for seven years. In November we found out that she had a “something suspicious” on her cervical spine (C3). The pain was being managed well until a few days ago. Josie started limping on her left rear leg. Back for more X-rays. We found out that she had arthritis in a previously dislocated toe, no sign of bone cancer in her leg. Sadly, we found out that she had a large mass around her liver and spleen that had already displaced other visceral organs. Josie crossed the bridge lying on her favorite pillow, with her Mommy & Daddy gently holding her and telling her how very much she is loved, and that Vera, Angel, Sally, Cohen, and Bashful are waiting for her. We have no doubt that Josie was in the most loving home and only knew the people who gave her the best home for the time she had left. 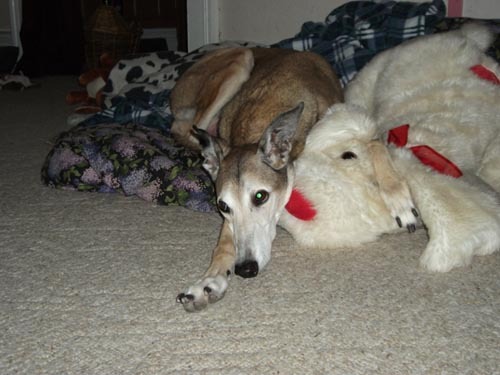 Diane and George are special people because they only adopt senior greyhounds. They know that their time with their hounds may be limited. But they open their hearts to give those dogs the best home and love in the time they have left. They are our special angels who keep our Craiger’s List an important part of our work. Rest is sweet peace Josie.